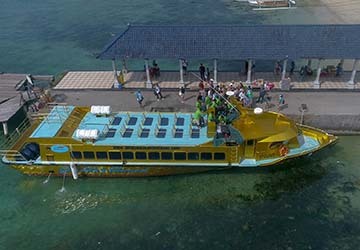 Over the past few years, travellers longing to traverse between Bali and the Gili Islands have come to rely on the quick, convenient and cheap crossings provided by Golden Queen Fast Boat. Most of the sailings take place during the peak of the Indonesian summer, luckily the air conditioned seating on the lower deck makes for a comfortable journey. As pleasant as the cool environment is downstairs, it would be a shame not to take full advantage of the gorgeous weather by topping up your tan on the spacious sun deck. The crossings vary in their duration, depending on the route; the shortest sailing lasts around 90 minutes, whereas the longest route is just over three hours – fortunately there are clean and hygienic toilets on board so you won’t have to worry about having an uncomfortable few hours. The operator prides itself on its safety regulations, never endangering the passengers and ensuring each person on board feels reassured throughout the entirety of the sailing. The diligent service to the passengers isn’t only apparent whilst on board – the staff will also arrange a free transfer to your resort once you’ve disembarked the vessel. Directferries.co.uk allows you to compare Golden Queen Fast Boat timetables and fares with all alternative ferry operators before deciding on the best option for your trip.